Charles Schwab shares have declined 14% over the last 12 months, but the company performed well in the same period. 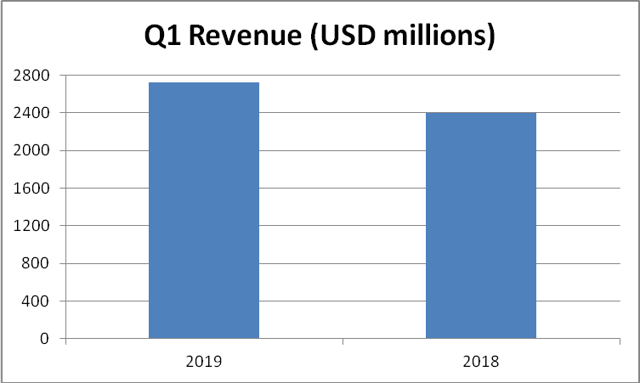 Net interest income represents the main revenue source for the company. The outlook for the company is mixed considering both positive and negative developments. Charles Schwab (SCHW) shares have declined 14% over the last 12 months, but the company has posted robust financial performance figures over the same period. However, the future outlook of Charles Schwab is a mixed bag – there are positives as well as negatives. Weighing in these positives and negatives, I rate shares a hold at the current market price. Charles Schwab reported net revenues of $2.7 billion for Q1 2019, up 14% from the revenues reported in Q1 2018. Net interest income for Q1 2019 was reported at $1.68 billion, which is a significant improvement from the $1.26 billion reported in the corresponding period last year. Approximately 61% of company revenues came in the form of net interest income. As such, dynamics driving interest income for Charles Schwab can have a material impact on the bottom line of the company. 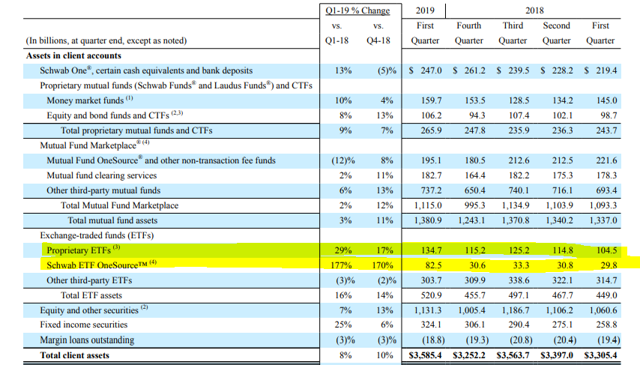 First, the rising rates environment helped Charles Schwab expand its net interest margins in 2018 and this is reflected in the Q1 2019 performance as well. As things stand today, the Federal Open Market Committee (FOMC) is likely to keep rates stable in 2019, and the patient stance of the Fed as confirmed by Jerome Powell paints a pessimistic outlook for further net interest margin expansions in 2019. On the other hand, allocation to cash accounts are expected to decline in 2019 as the macro-economic outlook is expected to improve and provide a boost to investor confidence, which would then result in higher equity market investments. 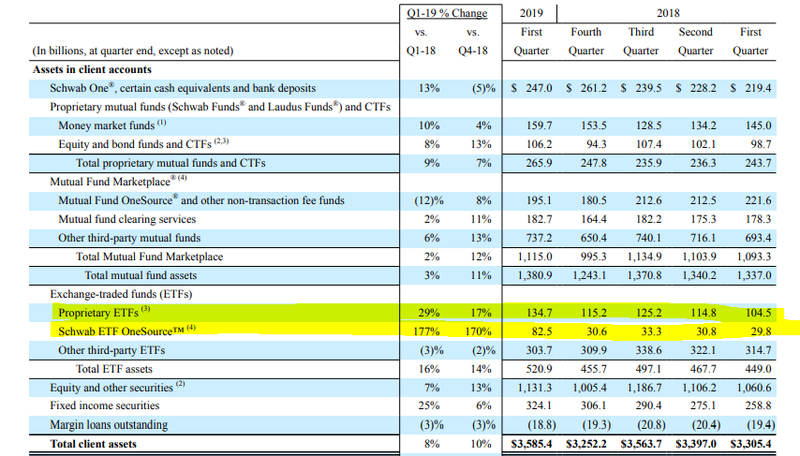 The improved net interest margin environment benefits the company when client funds are held in bank deposits, and allocating cash to other types of investments will adversely affect interest income of Charles Schwab in coming quarters, which should be factored in the analysis. 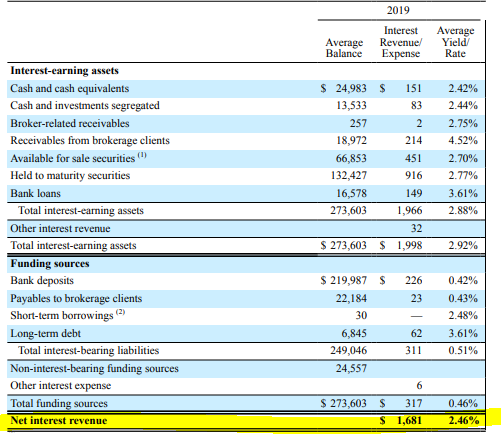 Undoubtedly, Charles Schwab will see its margins come under pressure over the next 12 months as revenues earned from all other categories have a lower yield than bank deposits. On the back of higher revenues driven by higher net interest income, Charles Schwab reported $925 million of net income available to common shareholders in Q1 2019, a significant uptick from the $746 million reported in Q1 2018. Overall, Charles Schwab reported stellar performance figures to kick off 2019 on a positive note. Whether or not this momentum will continue in 2019 is yet to be seen, and the future outlook for Charles Schwab looks mixed at this juncture. In the financial sector, having a large scale often translates into higher profitability through cost advantages, and provides a company with the ability to market their products to a larger client base than its peers, which usually ends up in economic moats. This is true for Charles Schwab as well. The massive scale of Charles Schwab has enabled them to provide trading services across asset classes at industry leading cost levels, which has been instrumental to the success of the company. Even as the financial services industry experience rapid changes with the invention of robot-advisory platforms, Charles Schwab will continue to remain a go-to solution for investors to trade securities based on the cost advantages it can pass through to clients. On the other hand, the industry leading cost basis of the firm has helped the company improve its profit margins considerably over the last 10 years. One major factor for this growth is the shift to bank products, which has much higher yields to the firm as discussed in the previous segment. 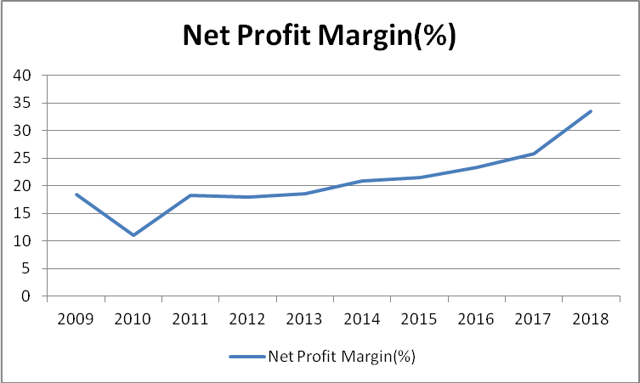 Profit margins might however come under pressure for reasons discussed in the previous segment, and this should prompt investors to seek for a higher margin of safety to invest in SCHW. Charles Schwab passes on its cost benefits to customers by charging lower commissions for trades, which is helping them attract a sticky client base. Scale will remain one of the major advantages Charles Schwab has over its competitors, and this will remain true in 2019 as well. However, the ability of the firm to expand its margins in 2019 is questionable. Since the end of the financial crisis, exchange-traded funds have gained traction and become one of the most popular investment vehicles in the modern day. The growth in ETFs has negatively impacted the profit margins of almost all asset management companies, which comes in as no surprise considering the lower fee structure of ETFs in comparison to actively managed funds. 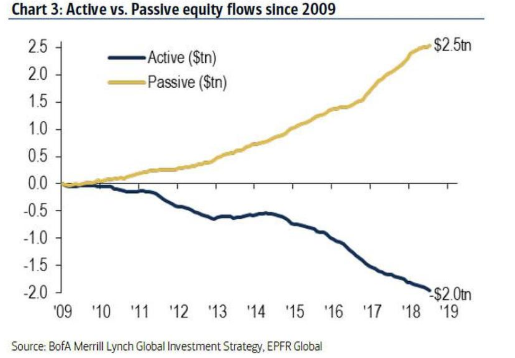 The popularity of passive investing as opposed to active investing has driven the growth of inflows to ETFs, and many economists have continued to argue that active funds are failing to provide alpha to investors. In 2018, Charles Schwab was ranked among the top 10 issuers of ETFs, and this represents how the company has gained momentum with the growth of ETFs. Proprietary ETFs and Schwab ETF OneSource have grown in size over the last year as well, and client assets invested through Schwab ETF OneSource has more than doubled from Q4 2018 to Q1 2019. 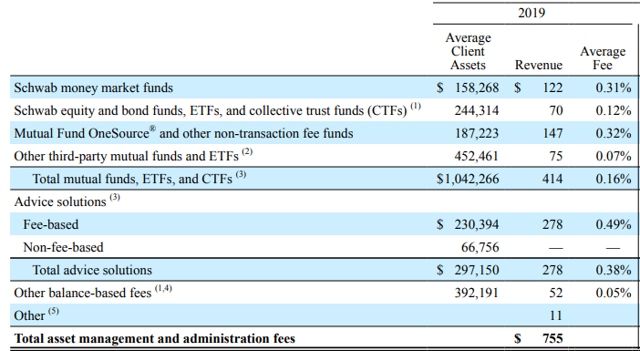 ETF offering of Schwab is expected to bring in billions of dollars to the company as client assets in the future, but the tilt in client assets toward ETFs will further pressurize profit margins in the future, considering the low fee environment. The annual dividend payout grew a staggering 55% in 2018, and the trend is set to continue in 2019 as well. In January, Charles Schwab announced a 30% hike to its quarterly dividend, and there could be more dividend hikes along the way as the company transfers its money market balances to more profitable bank accounts. Following a period of stable dividend payouts, the company is now making some positive moves and dividend payout has grown over the last 3 years consecutively. Dividend investors should be excited about this new development, but even with the recent hikes to the dividend payout, the yield still remains just a notch below 1.5%. The $4 billion stock repurchase program authorized in January should provide an additional stream of income to shareholders in the future as well, and the company is looking at capital distributions more positively, which is a good sign for investors. The median target price by analysts represents an upside of 8% from the current market price. The bank account segment will support higher earnings in the future as money market funds are moved into these accounts, which provide better yields for the firm. Considering the possibility of an economic recession within the next 10 years, asset management revenues might take a hit as trading activities will considerably decline in such a scenario, and this was visible in Q4 2018. The market downturn resulted in lower than expected trading revenue for the firm. SCHW is trading at a significantly lower P/E than the 5-year average, but I do not expect shares to converge with the historical average anytime soon. However, over the long-term, higher revenue growth supported by the shift from money market accounts to bank accounts coupled with the acquisition of new clients to the firm should support SCHW to trade at a higher earnings multiple as investors turn optimistic of the future outlook. Considering the complete picture regarding margins, interest rate environment, and revenue growth expectations, I remain cautious about investing in SCHW at the current market price. The outlook does not look bleak for Charles Schwab, but there are other investment management companies trading with a very high margin of safety, better prospects, and higher dividend yields. BlackRock is one example of such a company to invest in. I rate SCHW a hold at the current market price. There are a few risks of investing in SCHW. Interest rates are set to remain stable in the foreseeable future, which is a negative development for Charles Schwab considering the dependency of the firm on interest income. The possibility of a recession is a risk for investors as Charles Schwab will see its trading revenue eroding under adverse economic conditions. The shift to passive investment products poses a threat to profit margins of the firm as these are low-cost products. There are mixed signals about the future outlook of Charles Schwab, resulting from various macro and micro level developments. The company is certainly in a better position than ever to provide robust returns to shareholders, but this does not warrant investors to leave out the macro-economic picture which includes the possibility of stable interest rates and a recession. Shares are a hold at the current market price as I believe the current market price reflects the growth potential plus risks the company is facing, but a better margin of safety could push shares to undervalued territory.